I came across this on Twitter today (h/t to @HG54). No longer content to publish scientific papers months, even years, after extreme weather events, exploring how each weather event might, or might not be, attributable to man-made global warming, scientists now want to get in there quickly and state within hours or days if a flood or heatwave, blizzard, violent storm, etc. was due (in part at least) to anthropogenic CO2. Why? Because ‘real’ scientists need to quickly “get sound scientific analysis to the public to help counter misinformation, deliberate or otherwise, about an event”. That strikes me as ever so slightly hysterical and paranoid to be honest, as in ‘Oh my God, some amateur might come along and show that the recent bad weather is not really that exceptional in the context of past bad weather – so we’d better get in there first and claim it for climate change™!’ Paul Homewood is a serial offender in that respect. I’ve had a go at it myself once or twice. Extreme weather attribution is an obscure ‘science’, reliant upon a rather cliquey peer-reviewed scientific literature pioneered by Peter Stott of the Met Office, consisting essentially of endless climate model runs, with and without anthropogenic forcings, looking at regional weather forecasts, global and regional climate change projections, and past meteorological data, then putting it all together in a giant melting pot to arrive at what is called a Fraction of Attributable Risk (FAR) for any one particular extreme event – basically, the increased probability of such and such happening if one assumes ‘known’ anthropogenic GHG forcings. You can call it science or you can call it hocus pocus. Rather than running models after an event, researchers like Dr. van Oldenborgh and Dr. Otto shorten the process by using models that have already been run. “The only way we can do this rapid attribution is by precooking everything that we can,” Dr. van Oldenborgh said. There you have it; pre-cooked, ready to go model runs that they can just throw into the wok, sizzle and serve up almost immediately for public consumption. Hubble, bubble, toil and no trouble! Although the hope is that such studies will eventually become so routine that there is no need to publish the findings in a scientific journal, for now, at least, a research paper has to be written and submitted for peer review. So for the flooding analysis, that was another week’s work for Dr. van Oldenborgh. Inconvenient. Pesky deniers and fossil fuel shills still have the upper hand for the time being. But they’re getting there. Take, for instance, the flooding in France and Germany at the end of May this year. They have an attribution! Climate change was definitely implicated in the flooding in France, but the results of the Climate Central World Weather Attribution study are inconclusive for Germany. Which is odd, to say the least, because the flooding in Germany was caused by the same low pressure system as the flooding which occurred in northern France a couple of days later! It would seem that, by crossing the national border from Germany into France, this extreme weather made the leap from ‘cannot be attributed to climate change’ to ‘can be attributed to climate change’! I’m not sure if that has anything to do with the EU open door Schengen policy or not. You might expect the opposite, i.e. attribution to be uniform across borders. But it appears not. Perhaps Brexit will save us from being afflicted similarly by ‘just weather’ crossing the Channel and suddenly morphing into climate changed weather, or vice versa. Who knows. To assess the potential link between the heavy rainfall in France and Germany and human-caused greenhouse gases in the atmosphere, Climate Central, the Royal Netherlands Meteorological Institute (KNMI) and the University of Oxford — as part of the World Weather Attribution (WWA)partnership which also includes Red Cross Red Crescent Climate Centre and University of Melbourne — conducted independent assessments using multiple peer-reviewed approaches. These approaches involve statistical analyses of the historical temperature record, the trend in a global climate models, regional climate models, and the results of thousands of simulations of possible weather with a regional climate model. Applying multiple methods provides scientists with a means to assess confidence in the results. Specifically, the team looked at trends in 3-day basin averaged precipitation in France and 1-day area-maximum precipitation in southern Germany [my emphasis] . . . . . .
By comparing trends from around 1960 to 2016, or comparing the current with a “counterfactual” climate (a climate without human-caused greenhouse gas emissions), the team was able to characterize the changing nature of heavy rainfall risk in these two regions. So they looked at rainfall in each country separately and compared the current rainfall with the past rainfall in each region. The 1-day rainfall in Germany was truly exceptional (in terms of the past records), even more so than the 3-day rainfall in France, but, because observations showed a significant decline in 1-day rainfall in the region and because only 1 climate model predicted a small increase in response to climate change (contrary to observations), they could not draw any firm conclusions on attribution. It was just a really extreme event. With France, all the climate models predicted a large increase in the probability of extreme 3-day rainfall in the Loire and Seine basins. So despite the fact that observations showed a positive but not significant increase in 3-day rainfall in both French regions, simply because the models were in good agreement and all predicted a large increase in the probability of such intense rainfall occurring, these researchers concluded that the exceptional rainfall in France could be attributed to climate change! On that basis alone! In reality, 3-day extreme rainfall has not increased significantly in France and has even declined very significantly (over 1 day) in Germany (since 1960 anyway). A very unusual storm comes along and upsets the apple cart in both regions, days apart, but climate scientists can only ‘fast attribute’ the French floods to climate change because their all singing-all dancing computer models predicted an increase in the probability of such events occurring (after 1960) in France only. Wow. That’s ‘climate science’s quick-as-you-can extreme weather attribution’ in action! Are we not amazed, astounded, gob-smacked and humbled? Or maybe just gob-smacked? Of course! Because what we’re saying is so important (and obviously true) that we ought to circumvent peer-review and sound scientific practice to make our advocate’s point! I can see no real justification for them anticipating not having to submit to scientific scrutiny what is, at the present time, a rather novel, if not untried and untested, certainly experimental research program investigating hypothetical links between man-made global warming and extreme weather events. It’s quite ridiculous that they envisage such rapid attribution becoming ‘routine’ any time soon. The antidote to such feverish reporting is provided by Mike Hulme in a publication: Attributing Weather Extremes to ‘Climate Change’: a Review. He has an insider’s perspective on this issue, and is certainly among the committed on global warming (color him concerned). Yet here he writes objectively to inform us on X-weather, without advocacy: real science journalism and a public service, really. I think we should give them credit for officially recognising the poor practice they already indulge in. Doesn’t a different scientist pop up now to claim that THIS climate disaster is probably caused by climate change? They swap scientists so that it doesn’t look like they all blame every weather event on it. You’d think that there was never any bad weather in the past. I’m waiting for the study of US hurricanes that adds the current hurricane drought to to long term average and concludes that 2005 was so far above norm that it was obviously an AGW signal. The accompanying graph will terminate in 2008 ish so as not to let the casual reader to be confused by data, It’s important not to use the latest data if they tell the wrong story. So we have one flooding event that provides two different results. The results are dependent on the placement of international boundaries. That sounds like a typical climate science result to me. The relationship between climate and extreme weather events presents an interesting statistical problem similar to the occurrence of rare events such as horse kicks in the Prussian Army, studied by Poisson. The discussion in the paper referenced below opens by mentioning the Poisson distribution, but proceeds to an analysis based on the normal distribution. Since Nassim Taleb’s work on fat-tailed normal distributions we have become wary of classing outliers from the normal distribution as too improbable to be “normal”. There is a progression from Poisson, to binomial to normal (Gaussian) distributions that corresponds to the intensity of occurrence of events. In particular, the Poisson distribution describes rare (extreme) events. One feature of the distribution is that it describes a process without memory, including a chaotic process. As the intensity of occurrence increases, the binomial distribution may fit better, and with further increase, the normal or lognormal distribution might fit better. If the normal distribution fits a continuum of events, then outliers may be located on a fat tail. This might merely confirm Taleb’s hypothesis that in nature tails are fat and tell us nothing about climate. Formerly it was believed that witches caused extreme climate events and had to be burned at the stake. Now we are told that we are all to blame and we must change to a more austere lifestyle, sans coal, sans oil, sans gas, sans anything. This is politics, not science. There are three legs to global warming advocacy, namely the greenhouse effect, the attribution to human causes, and the prediction of dire consequences. Of these three, only the greenhouse effect is settled science, but somehow the settled label has been stretched to cover the other two as well. How? Because of superior marketing. We “deniers” have lost the media war. Even if we increase our output to match the warmists in volume, they have better credibility. Short of approaching Exxon, BP and Mobil cap in hand for an annual propaganda budget in the billions, I don’t know how we can counteract that. But full marks to the Paul Homewoods, Jaime Jessops and Judith Currys who continue to fight, fight against the dimming of the light. If attribution is your job, that’s just what you are going to do, otherwise no job. Probably tops the list in the “scientists say” category. I wonder how many contrary papers make it through? Sounds like the climate equivalent of the pro footballer’s joke: ‘Get your retaliation in first’. Thanks for the interesting comments. I would just like to point out, for the benefit of those elsewhere who appear to be lacking comprehension of my sarcasm, that I was not implying that Paul Homewood was in any sense an amateur. I was merely suggesting that is probably the opinion prevalent among many ‘professional’ CAGW advocate scientists of those people generally who are sceptical of many claims put forward by consensus climate science. Re. attribution, we already have a suspect: the jet stream. ‘the jet stream will meander quite far north towards Iceland, before diving southwards over the UK in the middle of next week. Oh well, I doubt they’ll bother then, unless they can attribute the misbehaving jet stream to global warming, a la Jennifer Francis’ comprehensively discredited Arctic Amplification theory or something similar. It’s just climate mathematics, a newly discovered branch of statistics.. Put enough erroneous calculations into a complex formula and you can arrive at an accurate result. I had a look at the climate change element of the recent floods in Paris from the human perspective. That is on whether flooding is becoming more frequent and more extreme. As Paris is prone to flooding, there is a long history of measuring flood levels, the standard gauge being at Pont D’Austerlitz. I found data for every flood more than 6 metres above normal since 1870 and made a graph. 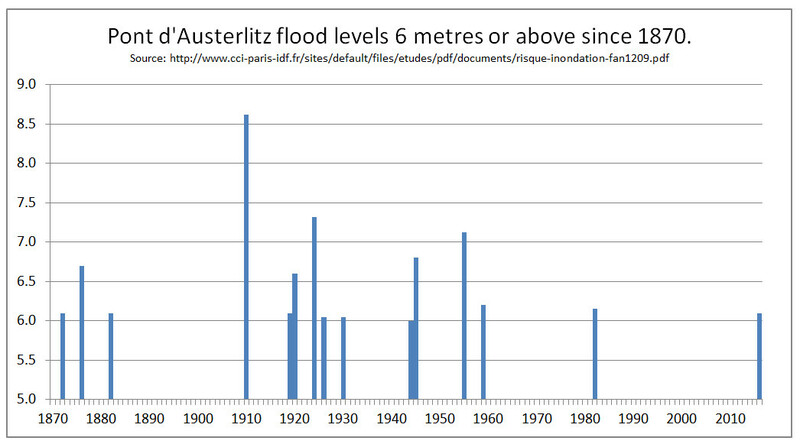 The 6 meter floods have become less frequent since 1960. This is partly influenced by flood prevention measures put in place the decades following the terrible floods of 1910. But it would also indicate that there was severe rainfall was more frequent in the first half of the twentieth century than in the decades before or after. This indicates two things. First, it that Climate change is always occurring, is not solely human caused and sometimes changes for the better. Second is that human beings are not at the mercy of extreme, weather events. The French Authorities have not just prevented some of the worst excesses of floods, but they also implemented extensive evacuation plans of both people and works of art from the museums for when the floods occurred. The floods were a large financial inconvenience, but not a financial or human disaster. You can’t blame the guard for not understanding the nature of a Poisson Distribution, but still.. A lot of fans of Greek art were inconvenienced due to a lack of understanding of basic stats. This post argues that “The more extreme a climate or weather record is, the greater the contribution of natural variability”. http://cliffmass.blogspot.com/2016/03/the-golden-rule-of-climate-extremes.html. Of course that does not fit the narrative so his argument is widely ignored.